When you visit Jerusalem's new First Station (Tachana Rishona) entertainment, activity and dining center, you never know what surprises you'll find there. It's open seven days a week with restaurants and coffee shops, Segway tours, hybrid bikes, walking tours, and a play area for kids. The station has an interesting history as a primary means of transportation between Jaffa and Jerusalem that started in 1892 and ended in 1998. Last year it was converted to the eight restaurant complex that also features ice skating, marionette theatre, and scheduled and unscheduled entertainment. In March, just in time for Purim, an unscheduled event took place in the open area between the restaurants and shops. 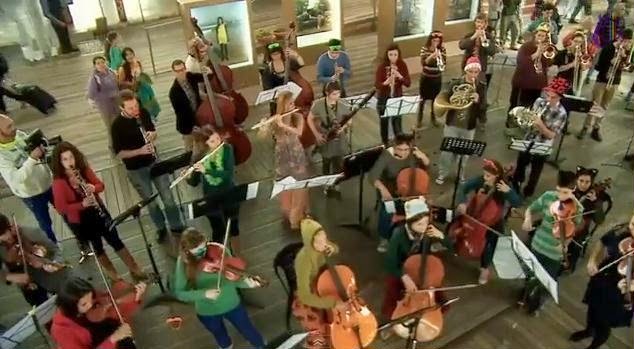 Without any announcement, fifty students from the Jerusalem Academy of Music and Dance, together with children from Sderot's Perach Tutorial Project, gathered at the station for a surprise concert. They were joined by Jerusalem Mayor Nir Barkat and philanthropist Shari Arison. The flash mob style performance was part of Good Deeds Day, an annual event that originated in Israel in 2007 and now takes place in over 50 countries worldwide. On this day, volunteers reach out to the less fortunate and the vulnerable. The crowd that was shopping and dining that day enjoyed a bonus musical performance, and we hope that you'll enjoy the video of the event. Who is more joyful than Israelis enjoying beautiful music and life?